By cupcakeSerenity on April 30th, 2012 . Filed under: Birthday Ideas, Cupcake Ideas, Decorating, Kids . My kids love Backyardigans. So I was happy to spot these Backyardigan Cupcake Rings from Zoomparty. A set of 12 costs $3.29, and makes for a super quick way to make your kiddo’s cupcakes extra special. 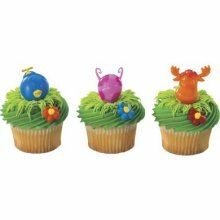 Zoomparty carries an entire of line of Backyardigan–themed party items, so, if you are ambitious, you could create an entire Backyardigans experience!